On December 1, 2014, Mozilla released Firefox 34. The major change with this release was the deal the organization struck with Yahoo to place that search companies’ product as the default search engine, displacing Google, which had been the search engine for years. If you use Google as your home page, and you conduct searches from there, you will not see any difference. However, if you search using either the Address bar or the Search bar (located to the right of the Address bar), you are now using Yahoo to perform your search. That is, unless you change your search providers. 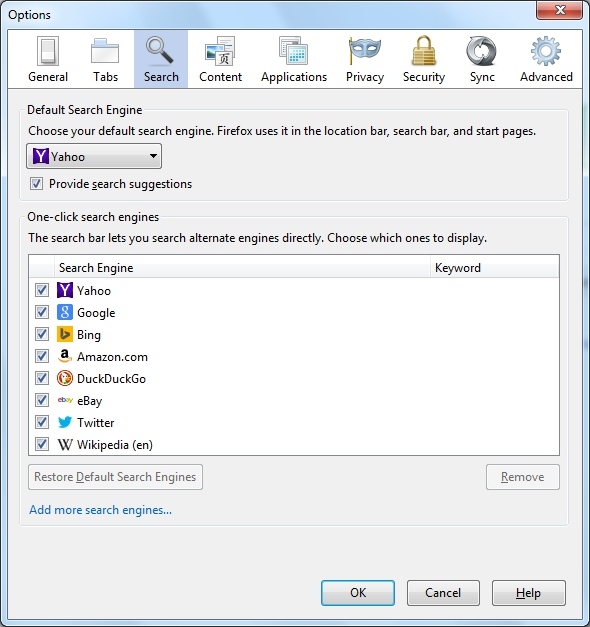 In the search preferences window, select a default search engine in the drop-down menu. Then, add or remove the check mark next to “Provide search suggestions” to turn them on or off. 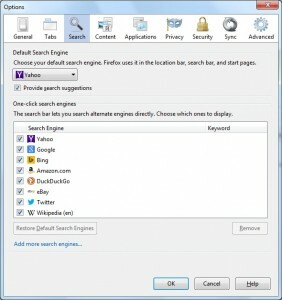 In the lower half of the window, remove the check mark next to each search engine you don’t want to use. This will keep them in the list of available search engines if you decide later that you want to use them. But, if you simply don’t want to use any one of the listed entries, check each one and click the Remove button. If, at any point, you think you may have made a mistake, you can click the Restore Default Search Engines button to bring the list back. It will still be up to you to select the search engines you want to use. To find out more, click the Help button.